So, Has Bionic Commando Been Fixed Yet? Mike played Bionic Commando a few months back, at a Capcom press event. Said it looked great, but had a few problems. I played it for around 20 minutes today, going through a tutorial level and one regular stage from the game, and you know what? It looks great. But has a few problems. Namely, that it just doesn't feel right. The game looks nice, and the mechanics of swinging are functional - as in, they're not so broken you can't leave the ground - but the whole thing still feels a little off. Like GRIN are painting a picture, have 98% of it on canvas, and are just standing there, brush in hand, unable to find the inspiration to make those last few strokes and tie the whole thing together. The swingy-swingy, for example, is a little cumbersome. The initial engaement is fine, you just run near something and shoot your arm. But once your arm is hooked on something, the camera quickly becomes your enemy, because the game seemed to rely on a bunch of strung-together swings where you need to nail 3, 4 or 5 in a row to cross an area. If they're all on the same level, that's fine. But sometimes you need to travel vertically, and things get messy. 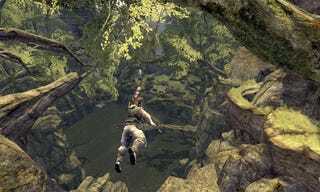 Retracting your arm to pull yourself up results in the player leaping upwards from the ledge they just climbed, which throws the camera off and makes hitting your next target difficult. Another niggle with the swinging mechanic is the reach of your arm. At times, your arm will extend dozens of feet during a swing. You'll se it, stringing you out well over a ledge. But at other times, I was flying right past a ledge or obstacle and I couldn't attach to it. Hopefully that's a bug they can fix. Combat, too, was a little off. The gunplay worked fine, and is probably what most players will rely upon when the game's released, because using your arm to take on enemies is more trouble than its worth. You need to execute combos to finish them off, which takes more time than it should, and picking up an object (like a car) or an enemy up takes forever (as does their hang-time when you throw them), making them look like ridiculous, sticky balloons. I'm slightly concerned about how close "early 2009" is getting when I look at the problems still plaguing the controls. Hopefully between now and the game's release, Capcom and GRIN can find that last-minute spark of inspiration and tie the whole game together.